Whether you are building a kitchen from the ground up or starting a remodeling project, it is important that you time in the design process. You want to design a kitchen that is aesthetically pleasing as well durable. When designing your kitchen, you also want it to be as environmentally friendly as possible so that you can save energy and money on your utility bills. Luckily, there are a few simple ways to create an environmentally friendly kitchen. One of the most vital elements to any kitchen are the appliances you plan to install, such as a refrigerator and dishwasher. When looking for appliances, make sure they are approved by the Environmental Protection Agency’s Energy Star program. EPA approved appliances use anywhere from 10 to 50 percent less energy and water compared to standard models. In return, you will have a more efficient and comfortable kitchen. 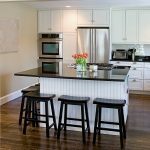 If you are deciding on furniture for your kitchen, you should look into pieces made of cork. The renewable resource is made from the bark of a tree and is free of the toxins found in manufactured materials. The material is sound-absorbent and resistant to mold and mildew, which is perfect for a kitchen. You will never have to worry about your cork-infused table suffering from water damage. This entry was posted on Friday, March 30th, 2018 at 2:03 pm. Both comments and pings are currently closed.